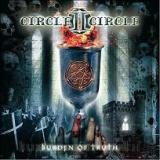 Circle II Circle packs a mighty melodic wallop with their third full-lenght album, Burden Of Truth. The whole album revolves around a theme of religion, self-reflection and something involving bloodlines and descendants of Christ. According to the bands website it bases itself on stories of mystical Templar Knights and stuff that has lately been explored by books like The Da Vinci Code. Well, since my reading is still obsessively circling around Orwell, Vonnegut and Thompson, all I can say about the theme is that it doesn’t prevent the songs from working brilliantly on their own. Brilliant – that is a fitting word for most of this record. Right off the bat I must say how I simply love Zak Stevens’ voice. I’ve been loving it since first getting in touch with it on Savatage’s Dead Winter Dead, and on this album it’s the best I’ve ever heard him. Strong and soaring on the hard hitters yet soulful and restrained in the mellow sections – simply excellent. Hearing him here brings me a lot of Bruce Dickinson-vibes. Not so much concerning similarity in tone or anything like that, but just the way he streches and utilizes his wide range to convey different emotions throughout the board. I get a straight-up Air Raid Siren-feeling. Stevens’ performance is also accentuated by the awesome and übercatchy vocal melodies that fill this album from start to finish. The choruses are like glue, almost in a pop, AOR-type way. Hearing such a comparison might cause many to shun away, but I assure you it is not a hindrance. Although some might consider the music itself a bit softer as well when compared to the band’s earlier work, it is still very rocking and metallic when necessary. Solos buzz around aplenty and there is no shortage of infectious guitar melodies either. You’ve got heavier, mid-paced hammers like Revelations and Messiah going well together with the fist-pumping hard rock-numbers like Who Am I To Be and Sentenced. The almost-mandatory ‘Tage-comparisons can be proudly attached to the piano driven-awesomness of the rolling Heal You or acoustic intro and the very distinctive layered vocal theatrics on the title track. With the exception the slow and mediocre The Black, every song here is a keeper with almost as many crossing into the killing kind. The closing ballad Live As One mixes the churning riffs with the lone piano, and even though I could so clearly picture Jon Oliva on this track, Zak manages to touch the soul just as gracefully. The production is stellar throughout, working well together with the varied dynamics of the song material. This album might be a bit soft for anyone seeking really aggressive and hard-slamming speed extravanganzas, but anyone who appreciates a versatile and very melodic metal outing, Burden Of Truth is a very recommendable purchase. By my experience, Circle II Circle has been improving with every record and if they make a similar advance in quality on the next album, we are talking masterpieces.